After fighting with my CBS-All Access streaming service for about 40 minutes, I was finally able to stream the latest Star Trek: Discovery “Short Trek” through my iPhone and later onto my 21” computer monitor. Attempts to watch it on my living room TV via my Roku ended in many strangled curse words and even a call to the CBS-AA service hotline. To anyone at CBS-AA? If you want to compete with Netflix and the other streaming big boys, you’ve got to get it together. Star Trek is your biggest draw…don’t be late, and don’t screw it up. Okay, enough of my griping. On with the show. This latest Short Trek, “The Brightest Star”, was written by Be Yeon Kim, Erika Lipoldt and directed by Douglas Aarniokoski. It tells the origin story of the USS Discovery’s sole Kelpien crew member, Lt. Commander Saru (played by the latter-day Lon Chaney, Doug Jones). Saru’s life on the Kelpien homeworld of Kaminar superficially resembles something akin to life in rural Southeast Asia. As the Kelpiens live their simple agrarian existence by the sea, they are also routinely and ritualistically harvested as food by an unseen race of technological overlords called the Baul. Saru’s father (Clayton Scott) is a local priest whose task it is to round up small groups of his people for use as livestock to the Baul. The Kelpiens have incorporated this ‘culling of the herd’ into their very religion, with cloaks and a circular gathering spot near a floating obelisk. Kelpiens not only accept this ritualized death, they welcome it as a release from life’s responsibilities, as well as maintaining the ‘balance’ of existence. This ‘death ritual’ reminded me of a more primitive version of the “Carousel” sequence from “Logan’s Run” (1976). Saru has a curiosity about lies beyond the sky, and he doesn’t buy his father’s pat answer about ‘the Watchful Eye’ (the Kelpien god, presumably). Saru’s curiosity is piqued when his father brings in a piece of Baul technology that fell from their harvester ship. He instructs his son to get rid of it immediately. Saru, of course, does not. In a bit of implausibility obviously designed to speed up the storytelling, the technically untrained Saru somehow (?) modifies the device into a communications beacon, which he uses to send a message to the stars. 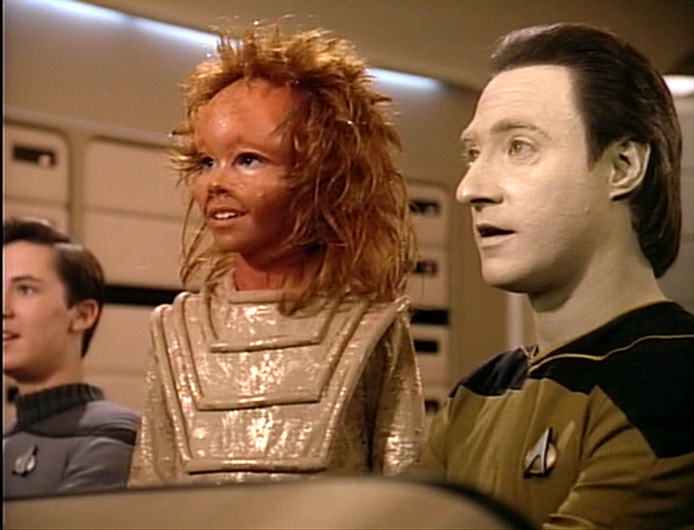 The notion of an innocent, curious, pre-warp drive creature sending a cry for help into the void and hoping for an answer reminded me of the child Sarjenka (Nikki Cox) from the Star Trek: The Next Generation episode, “Pen Pals” (of which this episode bears some resemblance). Once Saru gets confirmation that his message has been received by alien ears, he leaves behind his beloved sister and heads to a clearing, where (surprise, surprise) a Starfleet shuttlecraft from the USS Shenzhou lands. A not-yet-captain Lieutenant Philippa Georgiou (Michelle Yeoh), universal translator in hand, greets Saru, and lets him know how impressed she and Starfleet were by his reverse-engineering of Baul technology. She tells him that she convinced Starfleet to extend an invitation for Saru join her among the stars. Due to the Federation’s Prime Directive however, Saru must leave his family and his planet of Kaminar behind. The final shot sees Saru’s sister watching as the Shenzhou shuttlecraft warps away into the night sky with her brother aboard… heading to a new life with Starfleet. One nagging unanswered question is how the simple, seaweed-farming Saru could’ve turned a piece of Baul technology into a transmitter, let alone send a call into space. It’s a question that is never satisfactorily resolved or even addressed for that matter; he just…does. This really needed more development to make it work. As it is, it’s like a slave from ancient Egypt assembling an iPhone and checking his Twitter feed. The Brightest Star” has the greatest scope, if not storytelling ambition, of the Short Treks to date. Doug Jones is, as usual, amazing behind the complex Saru makeup… elegantly conveying the character’s curiosity, understated rebellion and awe. It also boasts beautiful location photography, an array of exquisitely complex Kelpien makeups as well as a nice ‘first contact’ moment between Saru and his future commanding officer Philipa Georgiou. It all makes for a solid, if not fully satisfying, installment. Sadly, this short serves more as a fill-in-the-gaps piece rather than a fully realized story. Given the short’s fifteen minute running time, perhaps it’s too much to hope for something akin to the original series “Amok Time” (which showcased Spock’s home planet of Vulcan and its complex customs). The brevity of “Brightest Star” is the real shame here, since the story hints at a fascinating Kelpien cultural acceptance as a lower-order creature on the Kaminian food chain. With a bit more ambition, this story could’ve been the answer to what a cow or pig might say or think if it could express itself in our terms. If developed into a full episode, this story might’ve had the potential to send many Star Trek fans into permanent vegetarianism.